Vogel, Slade & Goldstein has received top rankings among the nation’s 25 most active qui tam law firms representing whistleblowers in False Claims Act lawsuits, according to a first-of-its kind study by Stanford University law professor David Engstrom. The study provides valuable information for whistleblowers seeking to retain a qui tam lawyer. Professor Engstrom’s study found that of the 25 qui tam law firms across the country that have filed the greatest number of publicly reported False Claims Act lawsuits, VS&G’s qui tam lawyers had the highest success rate nationwide (65.9%) for achieving monetary awards on behalf of their whistleblower clients. VS&G also had the highest success rate (63%) for persuading the Department of Justice to join their whistleblower lawsuits. 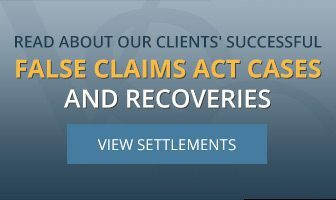 The comprehensive study, published in the Columbia Law Review, analyzed the outcomes of over 4,000 qui tam cases pursued between 1986 and 2011 by qui tam lawyers representing whistleblowers under the False Claims Act. When the Department of Justice joins in a qui tam whistleblower lawsuit, the likelihood that the whistleblower will recover money increases substantially. According to the author of the study, in nine out of every 10 qui tam whistleblower lawsuits in which the government “intervenes” (i.e., joins on the side of the whistleblower), the cases result in monetary awards. When the government declines to join the lawsuit, only one out of every 10 qui tam whistleblower cases achieves a monetary award. If you are searching for a qui tam lawyer, you may want to read Professor Engstrom’s study.